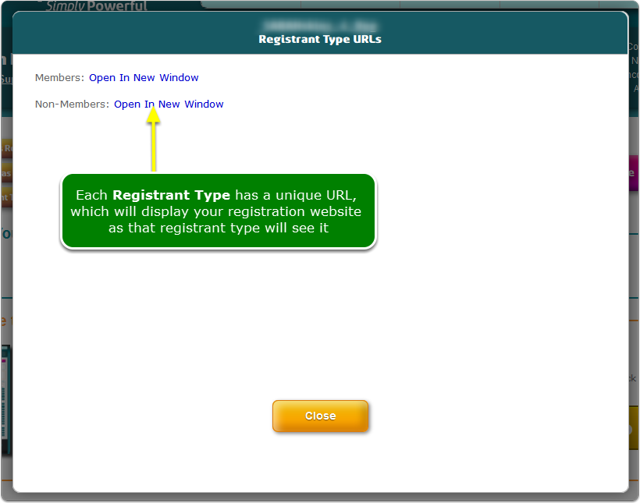 In order to see your static pages, click the View Registrant Type URLs button. Your Registrant Types are listed along with a link to the "home" page for that registrant type. Click the Open in New Window link to see your registration website with the static pages visible for that registrant type. You can set the "home" page for each registrant type using the Reg Website Wizard. The "home" page for a URL is the page that your registrant will land on when they click the registrant type URL. Each registrant type can have a different "home" page set when you define your static pages in the Reg Website Wizard tool.